The experiences of 10 people who cared for family members receiving palliative care are documented in a new book of personal stories. ‘Carers in the Grampians’ was launched at the recent Palliative Care Victoria conference in Melbourne, where it moved several experienced palliative care professionals to tears. The book, by digital storyteller Pippa Wischer, features images available for exhibition in galleries throughout Victoria. It includes a story from Kylie, who cared for Bernard, her husband of 20 years. Kylie writes that Bernard wrote his own eulogy, was honest and upfront with his children – telling them he was going to die – and died in her arms at their home. “This is the most intimate thing I’ve ever done in my life,” she wrote. The book was the brainchild of Ms Wischer and Jade Odgers, manager of the Grampians Regional Palliative Care Team. Mrs Odgers said it was designed to raise public awareness about how palliative care worked in regional communities and the level of support that came from friends and neighbours. “I’ve learned that although there are challenges in delivering palliative care in our region, I now know that I belong to a bigger team. “We learned the extent that people are being supported by local people. “We heard stories about the local milk bar owner and the local publican providing food. One woman, Nola, talked about her brother’s death and the support she got from his group of antique motorcycle enthusiasts. Mrs Odgers said she took an early version of the book to her team at work “and they all sat around my iPad and bawled their eyes out”. Mrs Odgers said she hoped the book would start conversations about death and dying. She said community based palliative care services invited people featured in the book to participate, and she was grateful for them sharing the highs and lows of caring for someone who is dying. Ms Wischer’s portrait photographs from Carers in the Grampians are expected to be exhibited in art galleries across Victoria. 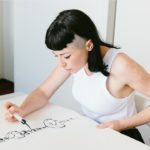 She has another exhibition, The Dreamers, with 40 portraits of people with life-limiting illnesses which is showing at Parliament House in Melbourne from 15-19 August. The Dreamers exhibition features photographs and the subjects’ reflections on life, death and dreams. Entry is free and open to the public. Ms Wischer has kindly given Palliative Matters permission to publish two stories from Carers in the Grampians. Click on the links to read Kylie’s story and Nola’s story in full. Carers in the Grampions was funded by the Grampians Palliative Care Consortium.